Eye-catching visuals and intriguing material make this overview of all things frog a first-rate choice. Another beautiful, well-researched work from the reliable pair. Librarians can purchase with confidence. A versatile early nonfiction title that will enhance both public and school library collections and is sure to become a household favorite. This fine overview is destined to be a popular addition to any science collection. 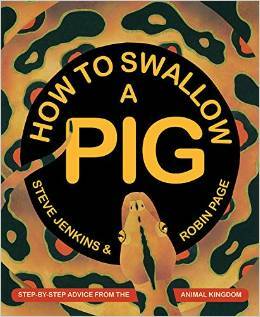 Jenkins and Page present another fascinating, fun, and attractive look at the natural world. Like Jenkins and Page's other works, this delightful purchase combines big, bold illustrations with intriguing science. A solid addition to the 590s. A Chicken Followed Me Home! : Questions and Answers About a Familiar Fowl! A charming addition to animal collections. Expect newly hatched domestic fowl enthusiasts to crow over this one.